We are constantly bombarded with meteorites from space – up to 300 tonnes a day. About 6 per cent are metallic, made of an iron-nickel alloy, ‘meteoric iron’, which was once the first iron used by humans before native iron was smelted. The rest, called ‘stony-iron meteorites, are a mix of metal and rock. Meteorites are thought to come mostly from a region of space between Mars and Jupiter – the Asteroid Belt which formed over 4½ billion years ago, at the dawn of the Solar System. These space rocks hit the Earth’s atmosphere very fast, at speeds ranging from 11 km/sec (25,000 mph) to 72 km/sec (160,000 mph). Such high speeds mean that they burn up and disintegrate – falling as pea-sized lumps or smaller, in fact most fall as tiny particles – thinner than a hair on your head and only visible using a microscope. 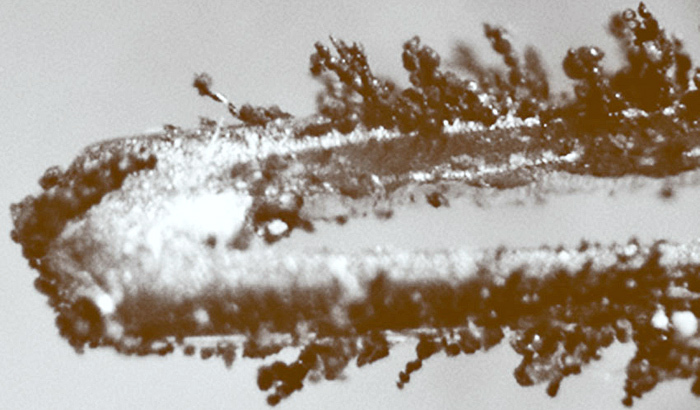 The tiny microscopic iron meteorites that fall as dust can be easily collected. There are various places to do this, each involving the use of a strong magnet. Neodymium magnets can be easily purchased, or extracted from old computer hard-drives. Place the magnet in a couple of plastic sandwich bags (in case the bag tears), or better still a ‘zip-lock’ bag. Then search for the tiny space dust. Drag the bagged magnet along. Any metal particles will stick to the bag. Place the bagged magnet inside another bag, open the magnet bag and remove the magnet. The particles will then fall into the second bag. Carefully label your sample with the date and where it was collected. You can search in several places, anywhere that rainwater falls and ideally collects. The roofs of houses provide very large surface areas and act as collecting traps, shedding rainwater mixed with space dust and other things into gutters and drains where it accumulates and can be collected by dragging the magnet. Place the material in some soapy water to help break free particle stuck to organic matter. Bird baths and small garden ponds can also provide material. Drag the bagged magnet along the ground or rub amongst material you’ve taken home It is better to use dry soil/dirt because if wet the tiny particles are harder to pick up. Dragging the bagged magnet over the bed of small streams can also pick up material. Collect leaves from an outdoor plant and wash them in a basin. Use the bagged magnet to pick up any particles washed off the leaves. Put the sample in a small glass dish or watch-glass and let it dry, or gently dry under a lamp. Examine under the microscope. All kinds of bits and pieces will be found, even non-magnetic ones caught up with the other material. Not all the particles will be meteorites, some might have come from factory and domestic chimney smoke, car engines, desert dust etc. Placing a magnet under the dish and moving it will move the magnetic particles which can be more easily examined free of other debris (take the magnet away before attempting to pick out any). Generally you want to find particles that are spherical as these are most likely to be micrometeorites. It can be tricky picking these out and it is advisable not to use a metal needle as they will stick to it and be the devil to remove. A bristle from a paint brush is ideal. If you use a magnetised needle it will collect the particles that can be examined whilst stuck on the needle as in these images. 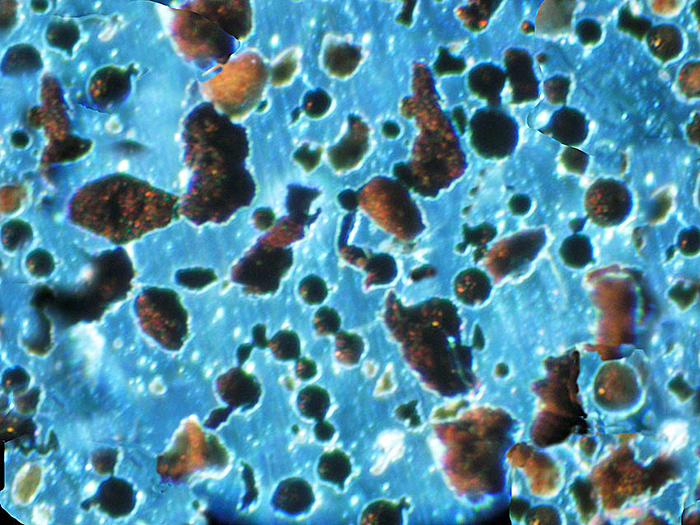 Particles can be dry mounted on microscope slides, see for a simple method.